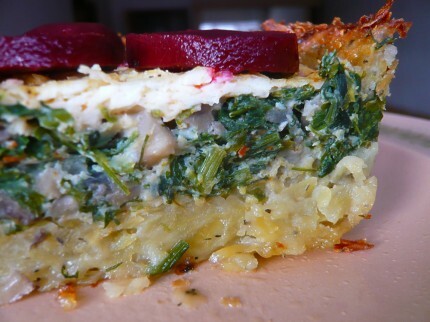 Basic quiche recipes call for pastry for the crust. However, if you want, you can replace the pastry with potatoes. 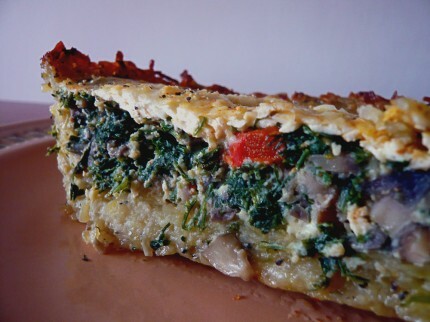 I did this and here’s my potato crust quiche recipe, which you can use as base for any kind of quiche you like: mine has mushrooms, red bell pepper, parsley, dill and onions, but variations are welcome. and about 6 medium size potatoes. 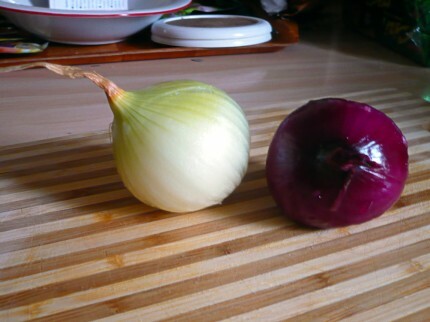 Don’t ask me why my onions were one yellow and one red. Use whatever you have, the color makes no difference in this situation. 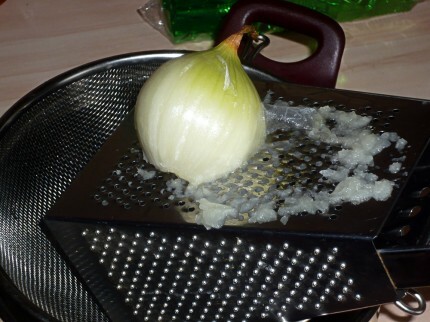 Peel and grate the onions. Here’s the part where you start to cry, so take your time, wash your face, grate some more, cry some more… the whole operation shouldn’t take you more than 5-6 minutes. 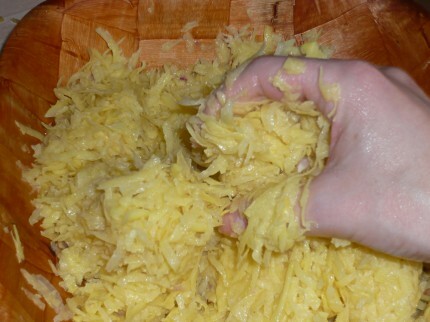 Peel and grate the potatoes. 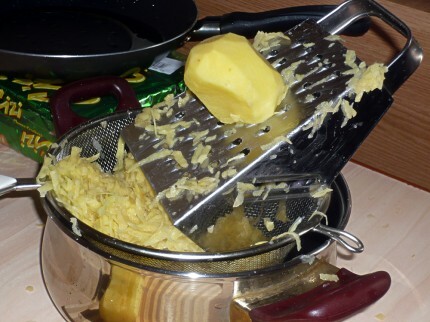 I grated them coarsely, but if you want a finer crust, use the fine side of the grater box. Pre-heat the oven at 450F. 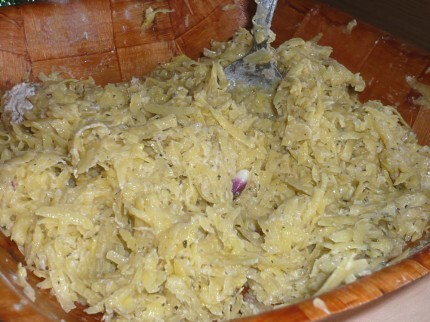 Squeeze the grated onions and potatoes very well to drain the liquid, then put them in a bowl and mix them. Add a teaspoon of salt, some ground black pepper and 2 tablespoons of all purpose white flour. If you want, you can add spices. I added about a teaspoon dried thyme. Mix everything very well. Oil a baking dish (bottom and edges). 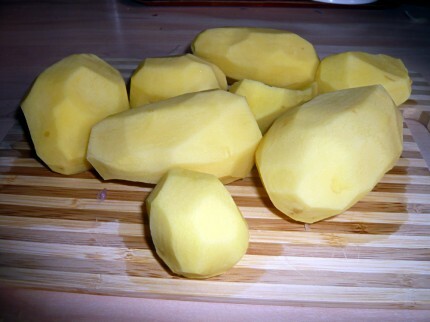 Shape the onion-potato mix into a pie crust, trying to get even thickness all over. Bake the potato crust at 450F for about 15 minutes. 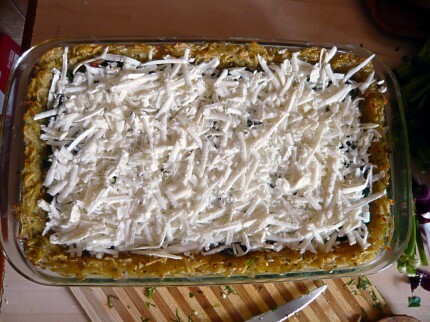 Take the baking dish out of the oven, brush the crust with extra virgin olive oil and put it back in the oven again for 10 more minutes. If you don’t have a special brush, you can use a folded paper towel to oil the crust evenly. 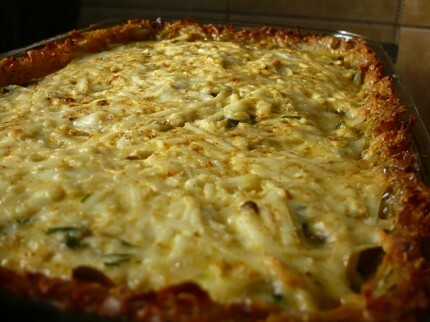 While the crust is baking, we are going to prepare the filling for our quiche. You need one onion, 15-20 button mushrooms, half red bell pepper, parsley and dill. Peel and chop the onion. 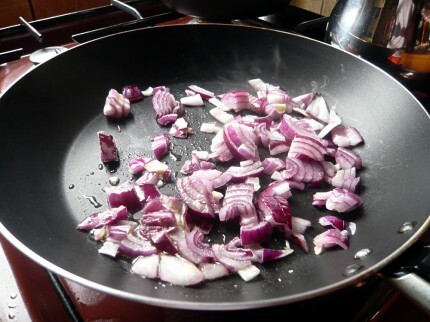 Heat a teaspoon of olive oil in a pan, add the onion and fry it for about 2 minutes, stirring a couple of times. 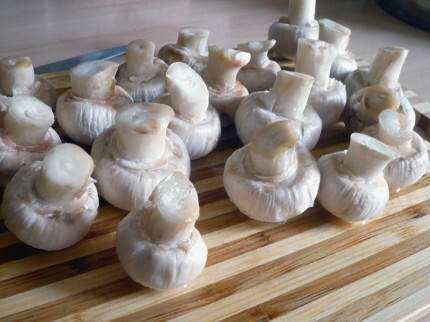 Thoroughly clean the mushrooms, chop them and add them to the frying pan. I also added about a teaspoon of fresh rosemary, minced, but that’s optional. Chop about half of a red bell pepper. Add it to the food. Stir and cook over medium heat. Chop the parsley and the dill and add them to the pan. 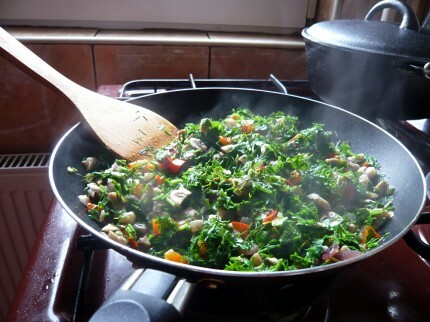 Continue cooking and stirring until the vegetables are soft and there’s a lot of liquid from the mushrooms in the pan. This process should take about 10 minutes. 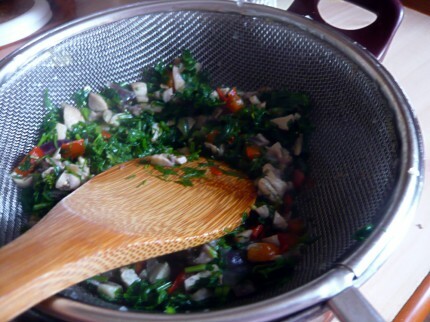 Remove vegetables from heat, transfer them into a colander and drain them very well. You can use a wooden spatula or a spoon to squeeze them dry. 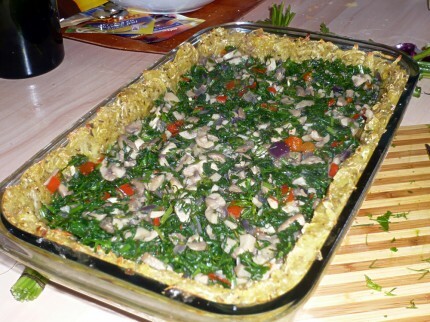 Pour the vegetables over the quiche crust, spreading them evenly onto the surface. Grate the cheese. 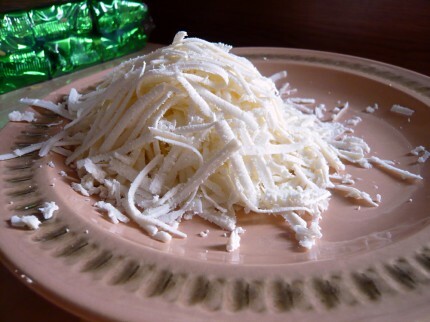 You’ll need about 1 cup of grated cheese. 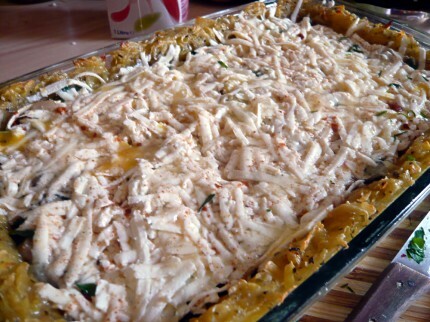 I used feta, but you can use any cheese you want such as Cheddar or Swiss cheese. 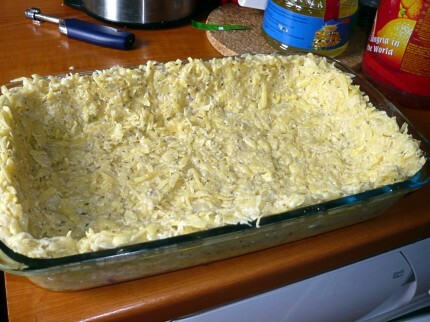 Spread the grated cheese on top of the baking dish. In a small bowl, beat 3 eggs. Please note that there are only two eggs in the photo, but after I beat those, I decided to add one more. 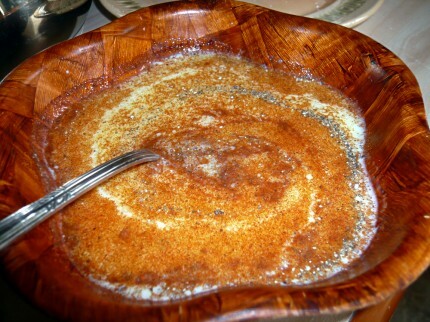 Add about 1/4 cup of milk, 1/2 teaspoon salt, 1 teaspoon paprika powder and some freshly ground black pepper. 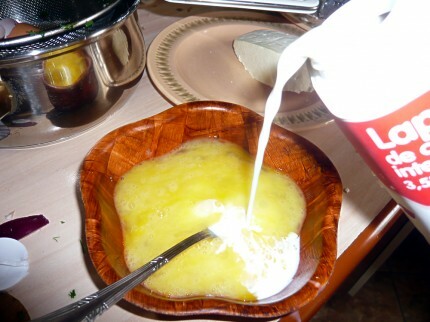 Mix well and pour over the grated cheese layer in the quiche dish. Bake over medium heat for one hour. 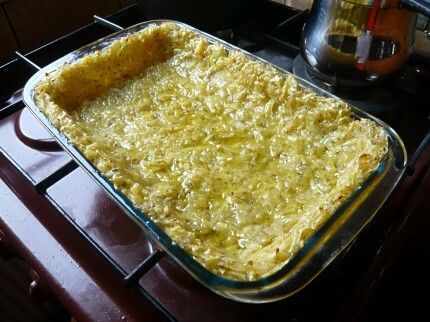 Let the quiche cool for 10 minutes after removing it from the oven. Cut and serve hot. 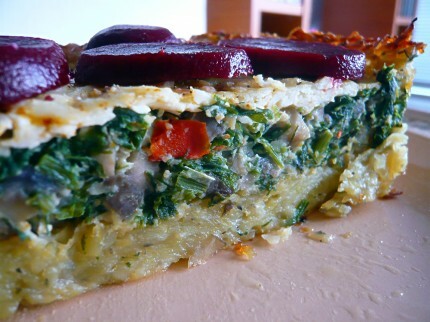 Serving suggestion: decorate the quiche slices with pickled beetroot or gherkins.